There are two new pets coming in patch 5.4 that will be craftable, Pierre and Rascal Bot. Both of these pets are Bind on Pick up, so only engineers with max skill level will be able to craft and learn them. To obtain the schematics that will teach you how to craft these pets, as well as the material Jard's Peculiar Energy Source, you will need to make your way to the Vale of Eternal Blossoms. 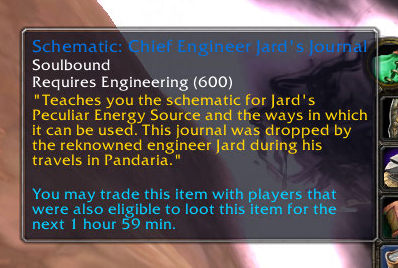 The mobs in the Vale will have a chance to drop Schematic: Chief Engineer Jard's Journal, which contains all necessary recipes. This engineering journal is categorized as "smart loot" and Bind on Pick Up so only engineers of appropriate skill level (600) will see this item drop. Players do not need to be level 90 in order to loot this item and learn each schematic. So are you ready to do some engineering tinkering? These pets are just waiting to be crafted and collected in 5.4! "Said that was a possibility. Most likely not going to add them this late in the expansion cycle." So the next expansion is a distinct possibility.